she might explode any second now. Feelings, not emotions, are needed here. can be lived with after all. And they’ll have a long path to ride together. It has been such a longtime since my last post on this blog and so many things happened and I have been in so many places… but I’ve always been too busy to update my blog, or maybe just lazy, not that it makes a difference. Anyway, I have some great news for you. And here you can order it and enjoy those beautiful places for 12 months! 1) The first step is to go to the button called My Horses (left bottom corner), and it will open a screen to ad a “new horse” There you have to enter name, etc and SAVE (top right) when you are done. That will lead to you another screen. 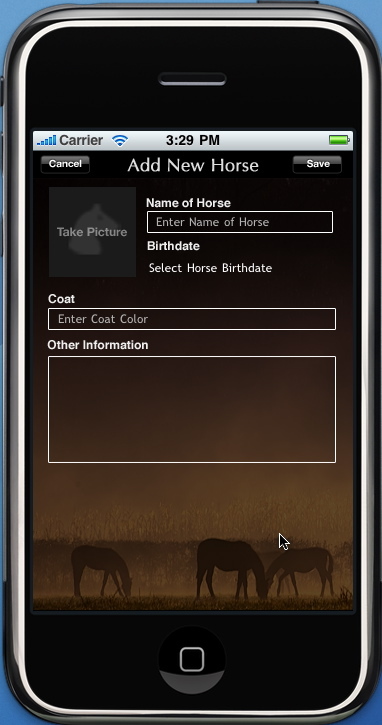 2) The next step is to touch the name of the horse, to open a new screen where you will find the name of the horse, a button to Edit it’s data and in the top right corner, there is a button with NEW EVENT. Please press that button. 3) Now you will find a screen where you have four different kinds of events, just pick the one that suits you and click “CREATE”, and then enter the fields about that event in the Events Screen. When you are done, remember to SAVE. 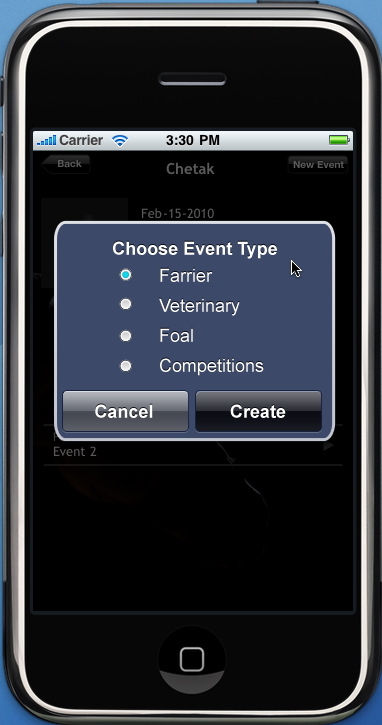 That is it, now you are able to ad events, ad new horses, edit the horses info, and if you like you can always go back to “Edit” and select DELETE to cancel a horse or an event. I just launched an app for iPhone and iPod Touch called ©EquiAgenda! It keeps your horses data handy and always available and is also a calendar, with 24 photos – starting from the month you buy this app. 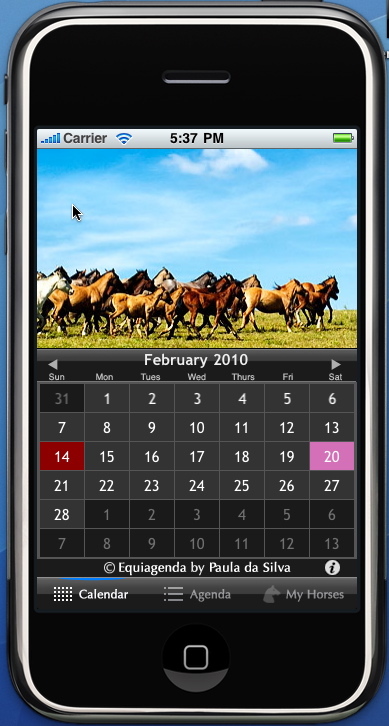 It allows you to track all of the important events in the life of your horse. With a quick glance, you can see vet appointments, medications, farrier, foaling, competitions, supplements and dietary notes for as many horses as you like! You can even upload a photo of your horse which will show as its avatar. 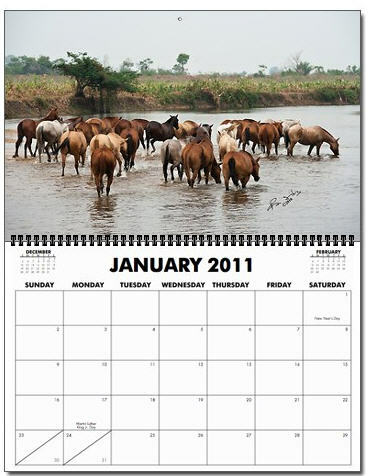 EquiAgenda© will keep you organized and help you keep your horses happy and healthy. The seminar will be held in the Region of Vejer de la Frontera – Cadiz, Spain which is known for its natural Splendor and the the typical Spanish “white Village look”. 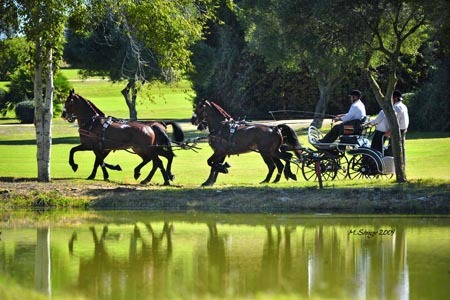 The Seminar will take place in the Dehesa Montenmedio Golf and Country Club which was voted as one of Spain’s most beautiful Golf Course and it is Internationally famous for its Horseshows. The Seminar will be limited to a Maximum of 12 Professional Horse Photographers or Advanced Amateurs. Minimum will be 9 for the seminar to be held. Needed equipment : a DLSR with a 70-200 telezoom, a Laptop and 16gb of Memory card. If you own other lenses and more memory all the better. The Seminar Fee will include pick up at the Airport, 5 nights in a double Bedroom , with a sharing Toilet/ Bath and Living room Bungalow. Also included in the Fee are Breakfast (Spanish Style), a 3 course Lunch with Wine or Soda , and on Request it will be available a Vegetarian menu.The Fee will also comprehends a typical Spanish Paella Dinner, free WIFI at the Restaurant, and a trip to Gibraltar for Duty free Shopping. Total cost for the Seminar is 850 euros. You can subscribe to it and get all the updates. Arrival at Jerez de La Frontera’s Airport. There are several flights from Madrid, the list is available from the Organisers. Pick up will be arranged and then Welcome Dinner – with the Traditional Paella. Afternoon shooting: conformation, driving and “concept” . Duty free Shopping in Gibaltar. About Gibraltar: First time visitors will be pleasantly surprised by the diverse range of attractions on offer in Gibraltar. Steeped in a history that has evolved from its strategic location at the southernmost tip of the Iberian Peninsula, where Europe meets Africa, visitors are assured of breathtaking scenery, wildlife and architecture, that captures the unique flavour of this Mediterranean City and its inhabitants. As a VAT free jurisdiction, Gibraltar’s popularity with visitors is enhanced by its value added shopping experience in famed Main Street. Please bring us a new government that works in the interest of the people in this country and not against us, and a proper Prime Minister. To send a greeting card with sleighs and snowbells to friends in Australia, Brazil and Mexico doesn’t seem to fit somehow. Paper cards would by now probably be perceived as cumbersome, and even environmentally aggressive, by most people. So a virtual greeting it is. And what about permanency? A year-old notebook is outdated, an older cell phone frowned upon. Even knowledge wanes, because what we had to learn yesterday will need updates by tomorrow. Friends speed through our lives – either because they go elsewhere (globalization again!) or because we all are simply too busy. Yet I do believe that the Holidays still are the solace of quiet, peaceful joy and of reflecting on the real meaning of life: on permanent values. This is what Christmas is all about, regardless of who you are or what you believe in. And once again, our horses come to our rescue, teaching us to be more human – and to enjoy the Holidays better. 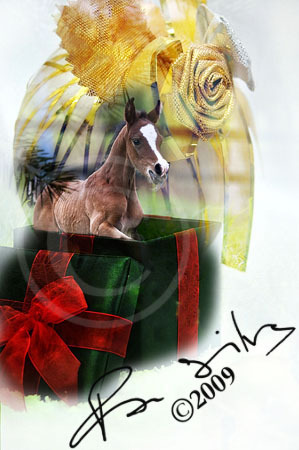 The “gift of horses” is manyfold. More than freedom, strength and happiness. More than closeness to nature, excellence in sports, helpfulness in work. Above all, horses help us find the way to our own selves – to what we were meant to be, or to what we may become. Marvel at it as if it is the first time in your life you see a horse. (And perhaps it is?) Be amazed at the pattern of its coat, wonder at its neck perfect curving, caress the landscape of its back. Look in its eyes – do you see it? Do you see yourself? Become lost there, knowing that it is safe, because the horse will guide you safely back. Horses’ greatest gift is that they have given themselves to us fully, and those of us who honor this offer fully will become better people through it. Let’s all live up to the gifts in our lives, during the Holidays, throughout all of 2.010 and many years to come!